It might be the most important bucket in your home! A source of light, heat and water packaged all in one convenient bucket. We hand picked essential items to help you and your family cope during unexpected power outages, storms and other emergencies. Keep in an accessible place, so you'll have it when you need it. Contains USA made and imported items. Note: Radio differs from what is shown. We have substituted it for a better version. We cannot always predict when threatening weather or power failures will happen, but we can prepare for them. If you are on the electrical grid, some point in your life you will experience a power outage, so do not wait until it happens. 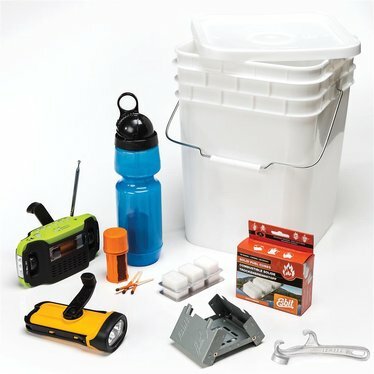 This kit is an easy way to equip your home for those unexpected emergencies. 1 Water Bottle Filter-It may look like an ordinary water bottle, but its powerful filtering system purifies both raw and municipal water, giving you safe drinking water. 1 Solar and Hand-Powered Safety Flashlight-Gives you light without ever needing batteries. Charge in sunlight or use hand-crank. 1 Hand-Cranked Radio/Flashlight-Not only does it give you another source of light, it also has a built in radio to help you stay informed during threatening weather and other emergencies.